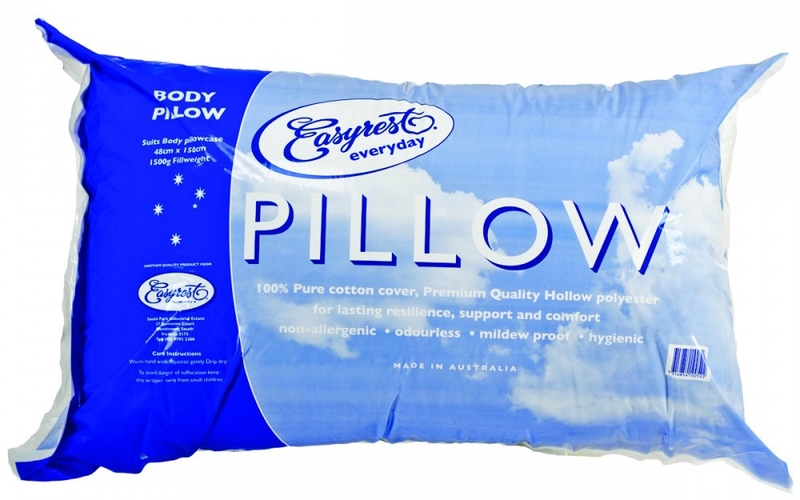 The Everyday Body Pillow provides added support and cushioning to your sleep routine. Unlike the traditional pillow, the body pillow can extend the full length of the body for knee and leg support, back support, and neck alignment. Place pillow in front of you for arm and leg support, or curl it around your neck and shoulders for luxurious upright lounging. Its versatile shape can also be used as a shared head pillow or roll guard. The pillow comes in standard-sized packaging, but expands to a full length of 48 x 150 cm. Live well and simply with hygienic, easy-care materials. Made with non-toxic hypoallergenic fibres, the body pillow helps reduce respiratory irritation. Its hollow anti-mildew fibres make cleaning simple and resist flattening over time. Hand wash and hang dry for optimal freshness and shape retention. Suitable for everyday use, the body pillow improves spine alignment and promotes clean living. Its allergen-free odourless design is perfect for sensitive sleepers or allergy sufferers. Offering full-body support in a variety of positions, this pillow brings luxurious comfort to your bedroom. Designed for custom lounging, the full-body pillow adapts to multiple sleep positions. Whether you’re sharing with family or lounging alone, the body pillow will help ensure a restful night’s sleep.